Apple TV 160GB review | What Hi-Fi? As we've come to expect from Apple, this media streamer is tied to iTunes and its corresponding media formats: the obvious disadvantage is that if you already use other media player software on your computer, you're going to have to jump through some hoops to get your media on Apple TV, most likely including converting your movie files – which is annoying. But if that all sounds rather unappealing, there are big advantages, too. For a start, the Apple TV is astonishingly easy to set up. It simply generates a code, which you input into iTunes on your computer, and the two are linked. 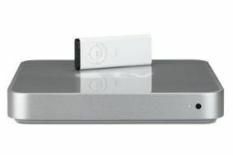 You can stream media from one to the other, or sync your entire library to the TV's 160GB hard drive, making it available when your computer's off. The other way the Apple makes up for its limited format support is with direct access to the iTunes Store and its huge selection of music, movies, TV shows and podcasts. And even though video resolutions are lower than the disc equivalents (480p for standard-def and 720p for HD), quality is superb. High-definition downloads are markedly crisper and more detailed than its rivals here, while colours are more subtle and realistic. Download a standard-def movie, and performance is similar to that of the LaCie, although the Apple is a tad sharper. These two leaders are close on sound quality, but the Apple has an extra degree of coherence to its soundstage. True, downloads from the iTunes store are a bit pricey, particularly with HD content (£4.49 for a movie rental and £2.49 for an TV episode keep), but the quality, convenience and usability of the system make it well worth it.